The Trump administration plans on loosening the regulatory red tape on the payday loan industry, the controversial business that helps millions of Americans make temporary ends meet at the risk of getting trapped in costly debt spirals. 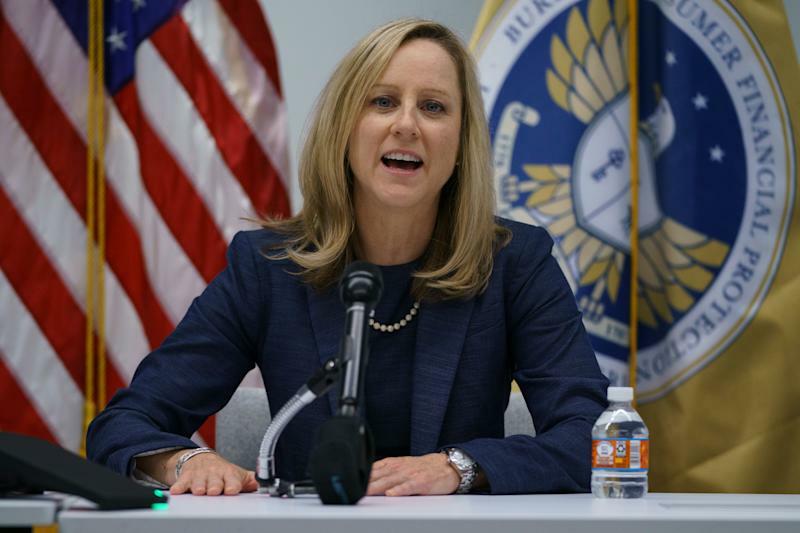 The Consumer Financial Protection Bureau announced today that it will no longer require lenders to make sure that borrowers are in a financial position to repay a payday loan, also known as “ability-to-repay.” The CFPB, led by Trump-appointee and former Office of Management and Budget official Kathy Kraninger, says the change will ultimately increase the availability of payday loans. The original rule was crafted by the Obama administration under then-CFPB Director Richard Cordray. It also included a number of other guardrails; lenders were barred from originating small dollar loans in quick succession and could not attempt more than two payment extractions from a borrower’s linked account. But it was the ability-to-repay test that was the real centerpiece of the regulation. “The principle that lenders must actually evaluate the borrower’s chances of success before making a loan is just plain common sense,” Cordray said when he unveiled the rule in October 2017. Proponents of the rule applauded the ability-to-repay test for disincentivizing lenders from originating frequent and loosely underwritten loans, but opponents argued that increased regulation would reduce the availability of credit. Proponents said the rule would keep borrowers from getting stuck in piling loans with eye-popping interest rates; opponents said the rule would kill the availability of small dollar loans for Americans struggling to live paycheck-to-paycheck. By rescinding the ability-to-repay test, Kraninger appears to sympathize with the latter interpretation. In a statement, Kraninger charged Cordray with using “insufficient evidence and legal support” in crafting the original rule. Former CFPB attorney and University of Utah professor Christopher Peterson told Yahoo Finance that removing the ability-to-repay test puts borrowers at risk of triple-digit interest rate loans that they will not be able to pay back. “[Trump’s] consumer protection agency gutted the consumer protection compromise laws that were designed to protect low-income families from predatory debt traps,” Peterson said. But some wish Kraninger had gone farther in paring back the rules. The CFSA, for example, wrote that it is “disappointed” that the CFPB chose to essentially keep the rest of the rule in tact. Alan Kaplinsky, a partner at law firm Ballard Spahr who works on consumer financial services issues, told Yahoo Finance that payday lenders would have liked to see a looser payments rule around how frequently a lender can try to tap funds from a linked bank account or debit card. The rule caps the number of attempts at two (after which the lender needs to ask for permission to try again) to protect consumers from getting hit with non-sufficient funds fees, but Kaplinsky argues that this is a useless rule on debit cards that already decline transactions if there aren’t enough funds to begin with. “It doesn’t go as far as the industry would like,” Kaplinsky said of the revised rule. The rule has been in flux ever since the Trump administration took office, when Trump appointed now-White House Chief of Staff Mick Mulvaney to replace Cordray as the head of the CFPB. But in the absence of clarity at the federal level, some states have stepped up. For example, Colorado voters in November 2018 approved a ballot measure capping payday loans at an APR of 36%. Other payday loan regulations exist in varying forms in Ohio, Arizona, and Montana. Peterson said those regulations can be effective and said other countries are also taking initiative. “Lots of countries don’t tolerate payday lending of any type,” Peterson said.